... terrible plans are afoot. A notorious painting, said to be a powerful artifact, has vanished - and the trail leads straight to the palace of the mad emperor, where it lies guarded by clockwork monsters of steam and iron. Now the city's spiritual factions - priests, rabbis, knights and sorcerers - are at war, vying to steal back the painting. You and your comrades must enter the emperor's subterranean Wunderkammer, do battle with its magical guardians, and recover the mysteries of the ascended Magdalene... or die trying. * Background on the historical setting of Prague, 1610AD, with conversion notes for any fantasy campaign. Warring factisns such as the Rosicrucians, the Knights of Malta, Rabbi Loew and his Golem, and others are described with plot hooks for future use. * New d20 rules for Mechanomancy, a steampunk magic school that creates mechanical monsters; Avatars, a new form of magic based on archeytpes of mass consciousness; and Renaissance firearms and armour. * Two new Unknown Armies archetypes, and magus and the Rake, and notes on using this tale of the 17th Century Occult Underground in your modern UA campaign. 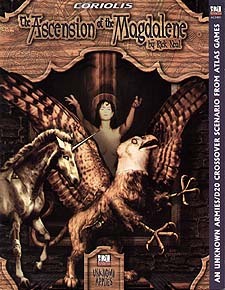 The Ascension of the Magdalene contains complete game statistics for both the d20 system and the Unknown Armies roleplaying game. To use the d20 system, this book requries the use of the Dungeons & Dragons Player's Handbook, Third Edition.